The Yas Marina Circuit is located on the spectactular Yas Island and has hosted Abu Dhabi's Formula One Grand Prix since 2009. Designed by circuit architect Hermann Tilke, there are high-speed sections, tight corners for overtaking and even a twisty street circuit-style section which sees the scars race alongside and underneath the twinkling Viceroy Hotel. 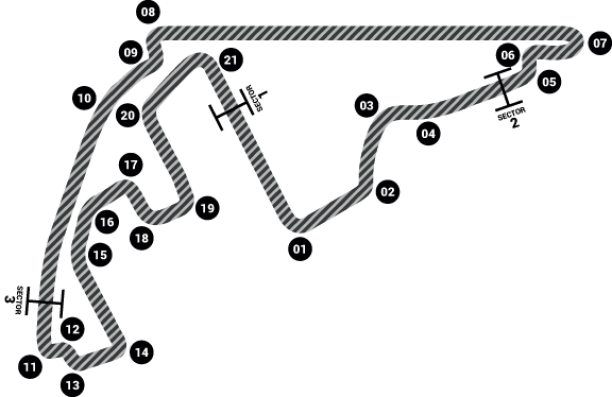 With a glamorous waterfront setting, the track features nine right turns and 11 left turns and is one of the few venues on the calendar to run in an anti-clockwise direction. Yas Marina was also the first F1 twilight race and requires powerful lighting to ensure a seamless transition from day to night.